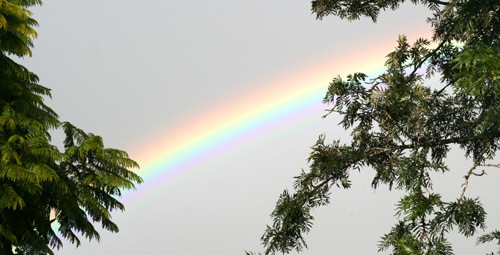 Aisha spotted a rainbow this morning during a sun-shower. After whinging for a while about the poor calibre of playgroup interactions or the over-organised system that means children are shuffled from one activity to another with a lot of parental supervision, I’ve started a Tuesday playgroup at our house — just the way I like it! We have a lot of room in our house for kids to play and ride bikes inside, and with the playroom full of toys for children of a variety of ages, I’m happy to share the space. Other playgroups get bogged down in meeting in halls/church buildings and relying on the toys brought along by members. We have no structure apart from an 11.30-ish shared meal where everyone contributes a plate of food. The time is just spent talking and watching the children play (and share each other’s drink cups!). We’ve been meeting for a month now, and the numbers of mothers vary between two and four. Yesterday, a new mum came with her son (aged exactly the same as Calista), and she made a wonderful contribution to the group. She’s the type of women who talks a lot — about everything. It’s great! As the hostess, it takes the pressure off me to find conversation topics, and she’s highly entertaining. I plan to do a little local advertising to get some more mums involved, but I’m happy with the growth of numbers simply from word-of-mouth! I’m feeling optimistic about the playgroup and hope it provides a necessary social connection for the mums who come along! You know Lauren I was reflecting on what is so different about this playgroup and I realised that it is just so much easier than the others I have been to. No pressure to be on time, have your money ready, write it up in the book, prepare an appropriate (allergy free) meal, set out the ‘right’ toys, pack up the toys into all the ‘right’ bozxes, stack them up etc etc etc. I used to leave feeling exhausted. Thanks again for starting this up and I hope we can enjoy it for a few more months yet until you guys are ready to go.